The first time that I saw this building was during the 1980s when it was one of Brisbane's fine dining venues. Although there was not the range of restaurants then that the city can boast now, entrepreneur and hospitality guru Ann Garms OAM painstakingly restored this former residence into an internationally known establishment. I can recall going there a few times to celebrate anniversaries and special birthdays. I may have eaten venison, which is now one of my favourite meats, for the very first time in this restaurant - in any case, I can still remember the succulent venison dish that I ate there. The following photographs were taken in 1987 when Roseville was a restaurant. Property speculator James Gibbon bought most of the originally available land on the Teneriffe hill. The portion on which this house stands was bought from Gibbon by fellow land speculator (also architect and newspaper proprietor) James Cowlishaw. Cowlishaw sold the land to Brisbane glassware merchant George Meyers in 1885, and he also designed this house for Meyers. 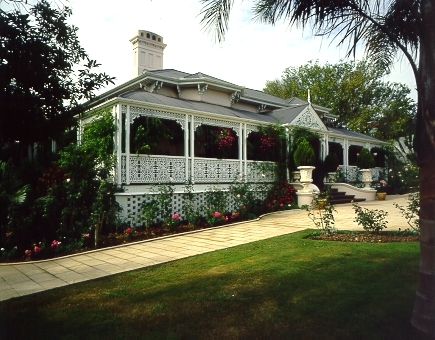 It is a one-storey rendered brick residence, with the hallmark Cowlishaw verandahs surrounding it. Meyers only lived here for a couple of years, but during that time he established a large rose garden that subsequently was the basis for the name Roseville, bestowed by a later owner. Later on the building was owned by the Roman Catholic organisation, the Society of the Divine Word, and they operated a hostel there. It was bought by Garms in 1980, when substantial repairs and refurbishment were carried out. Now the building is once more a private residence. My external view of the place is shown above, but it is now largely protected from view by fences, hedges and trees. To gain a better perspective of this wonderful house, take a look at this page, where there is a number of photographs. Also interesting is the fact that Aussie singer Bernard Fanning recorded parts of his video "Songbird" at Roseville - this is the link. The last time this property changed hands (that I could find) was in late 2010 when the price was reported to be in excess of $4.5 million. 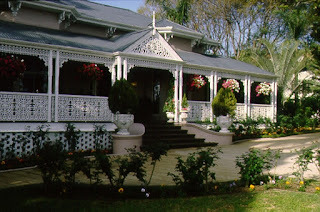 The house is low, horizontal, white, tree covered, with sweeping verandas - everything a beautiful Queenslander should be. 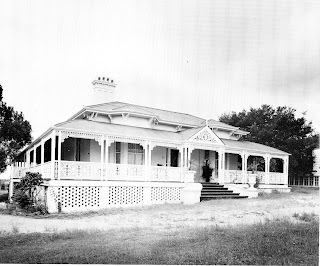 Just one question - what made the "hallmark Cowlishaw verandahs" different from other Queenslanders? From peeking into the modern photo, the fancy ironwork on the veranda seems to have been removed. I really just meant that having the verandahs was a hallmark of his work, not that he had specific verandahs that were his trademark. I think the ironwork is still present at the front of the house. There is a photograph of the rear of the house where they do not appear. I don't know whether they would ever have been present there. Cowlishaw and his contemporary Richard Gailey did so much groundwork in the evolving "Queenslander" style, where wide verandahs were used to stop the harsh sun from heating the walls of the house. Wasn't it a wonderful restaurant... you really felt that you'd been somewhere special.